My newest piece, “Giving Wing”, revisits the form of a metal sculpture of mine from a few years ago titled “Change”. 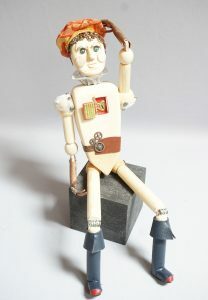 This time around, however, the similar looking figure sculpture is rendered in different media, with a different theme. “Change” was wrought in mixed metal with a concrete base, and was about metamorphosis and what can happen through transformation. 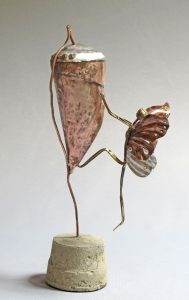 “Giving Wing” depicts a similar lithe winged figure shortly after emerging from its chrysalis, but centers the ideas of imagination and and flight. Literally “Giving Wing” to one’s ideas. 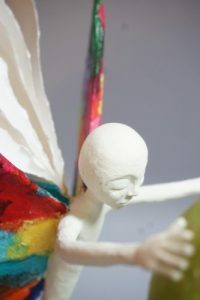 I created “Giving Wing” out of papier-mâché and paperclay. The color incorporated in the piece is obtained by layering the top layers of papier-mâché with tissue papers. I utilized a technique for printing on tissue that I first tried with “Questioning Alice” to again incorporate text into the piece. I guess I might refer to this as a sculptural collage. The trunk and branches of the tree bear quotes about dreams and imagination. The chrysalis pod’s quotes center on flight and wings. The wings of the butterly figure form a book. I’ve purposely left the pages of the book, and the figure itself blank as a contrast to the patchwork riot of color of the wings “book cover”, and an invitation to the viewer to write one’s own story. The show will be installed in the gallery on Monday, and the opening reception is next Friday, February 24th, from 6 to 9 pm. There is an author’s reading in the gallery with John Bemis from, Out of Abaton: Book 1- The Wooden Prince, on Sunday, March 5th from 4 to 6pm. 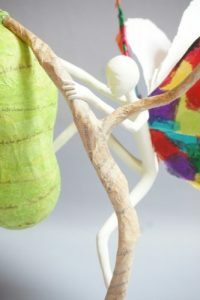 This entry was posted in Uncategorized and tagged art doll, figure, figure sculpture, Giving Wing art doll, Hillsborough Gallery, John Bemis, mixed media, one of a kind, the Hillsborough Gallery of Arts, wing on February 17, 2017 by lynnadmin.